Home » Features » What should Deeks do next? What should Deeks do next? These were sage words from the Gurkha when Deeks asked him how to walk across the Frozen Lake. This turned out to be good advice after Deeks returns to the Mission and finds Kensi gone. Kensi might wait for Deeks, but will he wait for Kensi? If you could tell Deeks what he should do while Kensi is far away undercover, what would you say to him? 7 Comments on What should Deeks do next? Deeks has got to let this run the course and hope that absence makes the heart grow fonder. It’s going to be killing him though… Just the wait will be agonizing. I think he should have a long conversation with Sam. He must have some advice he can share that would help Deeks get through this time. Those two need more bonding and it would give us an opportunity to see just how much Sam’s attitude towards Deeks has changed. 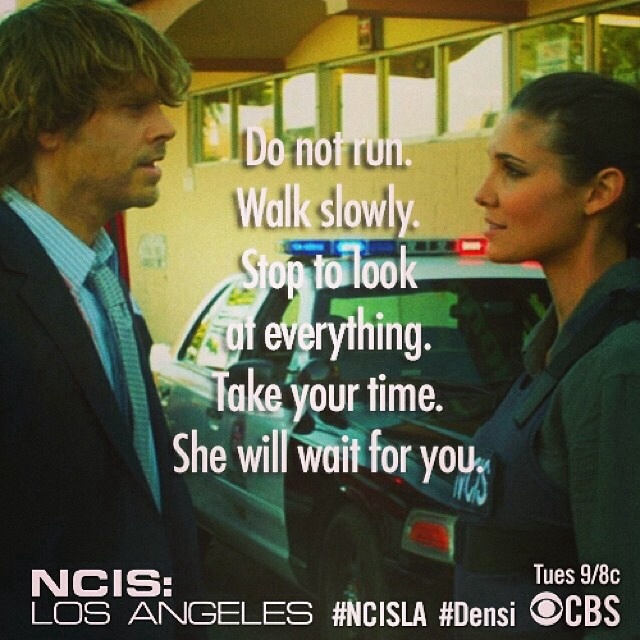 Deeks, follow the advise: walk slowly! If they would not have been separated for now, things might have gone too quickly between them and their careers might have suffered. Hetty does know what she is doing. She was always supportive of them as a couple. Remember her note to Deeks: Sunshine and Gunpowder and her heart to heart talk to Kensi. The separation is a great test of the strenth of their love. And they will pass with flying colors. Hang in there, Deeks. You know she is worth it. Patience. A powerful word. Many years ago, after our marriage, we were gifted a scroll with the character for “Patience” brush painted in Chinese Calligraphy. The word is formed by 2 different characters, “blade” over the character for “heart.” The two characters combined, symbolizes how difficult it is to practice the art of patience. The ability to practice patience, to wait when one wants to rush forward, to be calm and to be clearheaded in the face of adversity will bring rewards. Kensi asked Deeks to be patient with her. Deeks, you must not only be patient with Kensi, you should also practice the art of patience with Hetty. Hetty has it in abundance. Now that he has heard Kensi acknowledge their “thing” he will wait, though I’m not so sure he would have (or should have) waited if she had continued to deny her feelings and keep him at arm’s length. He will worry about her safety. He’ll try to get information about her status from anyone he thinks he can get it from. Unfortunately for him, Sam and Callen know no more than he does, and neither Hetty nor Granger will tell him anything. Deeks will probably be plying Nell for information, because she always seems to know more than anyone except Hetty. I agree with everyone. Deeks needs to be patient but I don’t know how much more he can take, I fear that one day he might have a break down. I just saw the sneak peak from 5×11 and I got extremely angry at Callen. A team leader shows sensitivity towards his team members and certainly aknowledge the fact that Deeks risked his life for Sam and Michelle…..ok, I won’t get into that now!